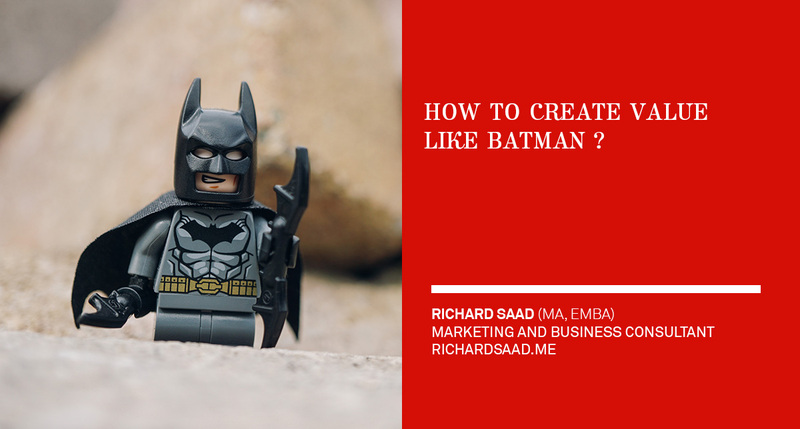 Richard Saad (MA, EMBA) » How to create value like Batman! Batman, the saviour of Gotham city, has been roaming various neighborhoods to capture criminals, save the elderly and keep the city in order. He is creating so much value for the city that he becomes irreplaceable. Don’t you want to become the Batman of your organization? Let’s break down the value creation process step by step. No, it is not the label that says “Great Value” on your 26 toilet paper package from Cosco. You know, the one that you are trying to fit inside your trunk. Value Creation is the evolution of Marketing which has significantly changed throughout the years. The concept of Marketing started after the Second World War. Supply began to exceed demand, and the first sign of competition between companies appeared. As an example, Proctor & Gamble started to add features that appeal to a specific target audience and differentiate themselves from other competitors. In 1950, the concept of segmentation kicked off, and companies began creating solutions to particular problems. Today, we talk about value creation and the empowerment that a product/service generates to each user personally and on his terms. In fact, there is a formula to create value. In a nutshell, customers see value when the benefits exceed the sacrifice. In other words, Value is about the benefits that the offering generates minus the three main sacrifices which are the price, allocated time and psychological fatigue. For instance, the iPhone has a valuable offering in the eyes of its customers. It is a cool brand with a beautiful design that provides its users a great experience and an interconnected ecosystem with iTunes, iCloud, etc… Most of us agree that iPhone has many benefits. However, Apple does not stop here. It increases the sacrifice level that makes the switch to Android way more difficult. The change from an IOS to Android requires time and energy to replicate the same usage habit. For instance, Batman is bringing so many benefits to Gotham that residents don’t mind paying for the infrastructure damage that its fight with Joker generates. We can measure the Value we are offering very easily: it is the loyalty level of its customers. In other words, the Cost-per-Value is the minimum required investment that creates a loyal/satisfied customer. The value creation process is the capacity to seamlessly and successfully explore the value, and create, communicate and deliver it back to the market. We create value by first finding the white space or the opportunity in a market. –Is there an overlooked or unsatisfied customer segment? — What is the essential customer segment? What does the customer need? What do customers want to get done? Where is demand increasing? The value exploration activity is based on primary and secondary data. Primary data is the gathering of intelligence and insight. The best way to achieve it is to live the customer’s pain and understand his reality. There are several methods to collect information on customers, and the main techniques are through interviews, focus groups, surveys and by observing the target audience in its environment. Secondary data is based on second-hand sources that help identify opportunities. Associations, statistics, governmental data, Google trends, ALEXA, etc. By combining these two types of data (Secondary and Primary), there are good chances that you can identify where value resides and how to create it. Once the Value is identified, the organization develops it. It is tricky because it has to fit with the business strategy of the organization. In other words, the value offering has to be profitable, feasible and endorsed by top management. It has to match the organization’s mission; otherwise, the project can be seen as a distraction. The Value has to be transmitted to the same target audience that provided the insight that helped identify the Value in the first place. Again, it is time to roll back the sleeves and get to be back with the target audience. The goal is to understand their media consumption and habits. It is imperative to grasp the audience’s media usage so that you can map their journey and their decision-making process. It is essential to know which media and channels your customers use so you can reach them efficiently. As I always say, communicating value is more than just a marketing campaign; it is the capability in creating a pattern that is repetitive in a consistent and well-articulated way. Once the awareness is created, and customers are lining up to buy what you’re offering. As an organization you have to make sure to select the right delivery channels. The latter can be through an intermediate or directly to the end user. Generally, the choice to work with an intermediate is to mitigate risk and the massive investment that is necessary to control the whole supply chain. However, with the rise of e-business, organizations are cutting off the intermediate and setting up their multi-distribution channels using the e-commerce, affiliate programs, and physical stores. They were successful in creating value by first identifying that families need a wide variety of movie choices at a meager cost. Then, they set up their business model around this concept, and they started by mailing DVD before migrating online with the streaming service. Today, everyone knows that Netflix offers a vast choice of films and original contents at a low price which is a proof that Netflix had successfully communicated its value proposition. As for the delivery process, it is a direct-to-users model with no intermediate as opposed to the previous rental model such as Blockbuster. From a Netflix perspective, the Value is in the volume of subscribers it generated. The more subscribers it has, the more it can negotiate rights and ultimately eliminate this cost by creating its content. Today, Netflix is valued at 158.84 billion. 1- Value creation is the evolution of marketing. It is beyond solving a problem for a customer segment. You create Value when you empower your customer, get his job done, fulfill his individual needs. Value has a formula which is Value = Benefits – (Price + Allocated Time + Psychological Fatigue). 2- Value is measured by the level of a customer’s satisfaction. Value generates satisfaction which is a prerequisite to loyalty. From a financial perspective the Cost-per-Value is the minimum required investment that creates a loyal/satisfied customer. 3- Value is created by first identifying the customer’s needs/pains, then the firm produces the offering, communicates and delivers it back to the market. In theory, it is an easy process. But unfortunately, few organizations manage the four steps seamlessly as they are good at either manufacturing or marketing.